The good news for Balbriggan just keeps rolling in with the official opening of the Stephenstown Link Road this week. 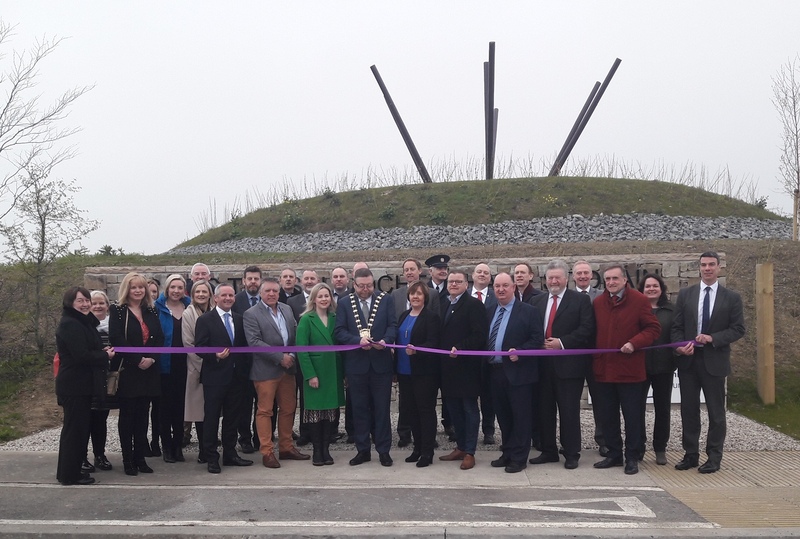 Mayor of Fingal Cllr Anthony Lavin cut the ribbon this Monday, April 8th, with other council members and participating engineers in attendance. The new link road is seen as a key piece of infrastructure development in Balbriggan, running from the existing roundabout on the Stephenstown Road to a new roundabout on Clonard Street Road, linking to the back of Millfield and on to the Naul Road. The project, with investment from Fingal County Council, included the construction of footpaths, cycleways, foul and surface water drainage, public lighting and utility services. It opens up almost 23 hectares of industrially zoned lands for development with the potential to bring approximately 900 new jobs to the area. Balbriggan is only 20 minutes from Dublin Airport and 25 minutes from Dublin Port. The M1 motorway is two kilometres away from Stephenstown Industrial Park while the nearby M50 makes much of the rest of the country highly accessible and the park a highly attractive environment to potential investors. A number of thriving businesses have already made their home in Stephenstown Industrial Park including EEC Hardware, one of Ireland’s top Builders Merchants; Tierney Kitchens specializing in fitted kitchens and bedrooms along with Rockabill Shellfish Ltd, a family run Irish company specialising in live, fresh and frozen seafood products. More recently these companies have been joined by Techcrete, one of the market leaders in designing, manufacturing and supplying architectural precast cladding in the UK and Ireland. Grimme Ireland Equipment Limited supports Grimme customers with Sales, Service and Parts. With more than 150 various machine types for the potato, beet and vegetable technology, the Grimme group offers the widest and most extensive product range in this sector and S. Duffy Plant Hire Ltd which was originally founded in 1986 to service the construction industry now specializes in the needs of rail work.